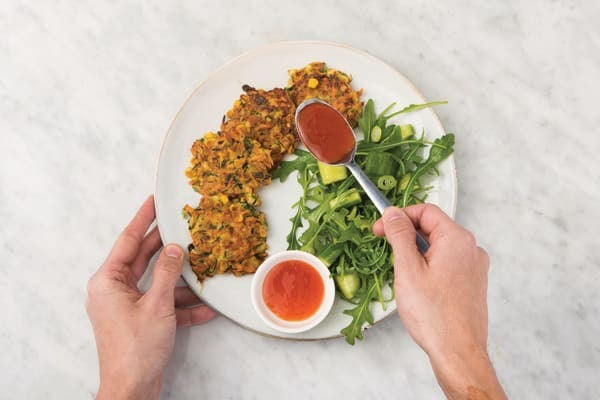 These juicy, sweet and salty fritters are the perfect marriage of autumn seasonal produce and easy cooking techniques. Leave the oven off and enjoy this tasty supper that is ready in record time! Drain the sweetcorn. 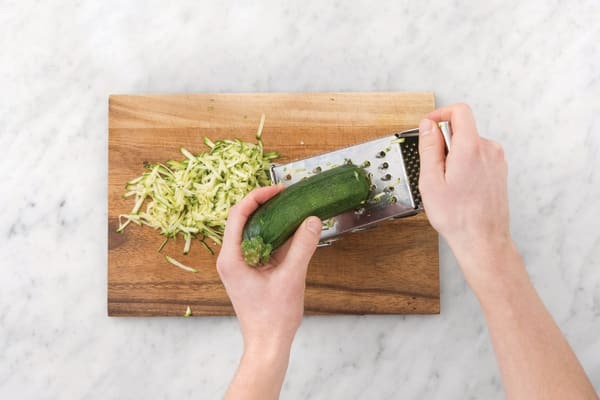 Grate the zucchini to get 1 cup for 2 people / 2 cups for 4 people. Grate the carrot to get 1 cup for 2 people / 2 cups for 4 people. Place the zucchini and carrot in a paper towel and squeeze out the excess moisture. Grate the haloumi (use suggested amount). Finely chop the long red chilli (if using). Finely slice the spring onion (keep the white and green parts separate). Finely chop the coriander. 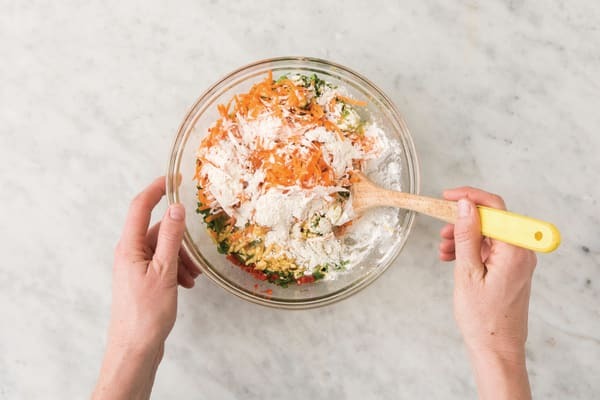 In a medium bowl, combine the sweetcorn, haloumi, zucchini, carrot, long red chilli (if using), plain flour, egg, soy sauce and the whites of the spring onion. Mix well. 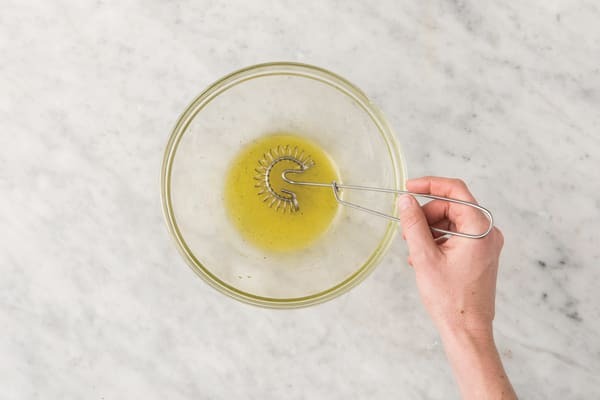 Heat enough olive oil to coat the base of a large frying pan over a medium-high heat. Once hot, add 1/4 cup of the fritter mixture and flatten with a spatula. Repeat with the remaining mixture. Cook for 3-4 minutes on each side, or until golden. TIP: Don’t flip early to ensure your fritters can set. You should get 3 fritters per person. 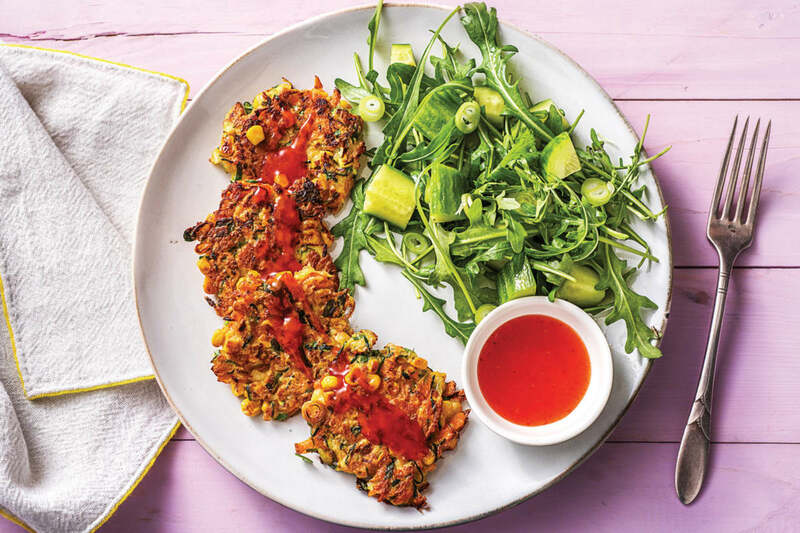 Set the fritters aside on a plate lined with paper towel. 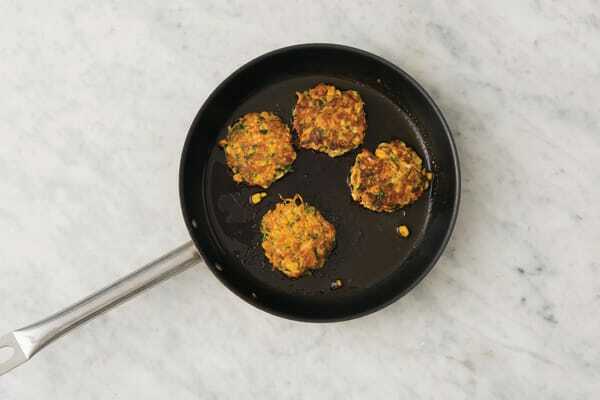 DTIP: If needed, add extra oil so the fritters don’t stick to the pan. While the fritters are frying, chop the cucumber into 2 cm chunks. In a medium bowl, add the Thai lime & coriander dressing. 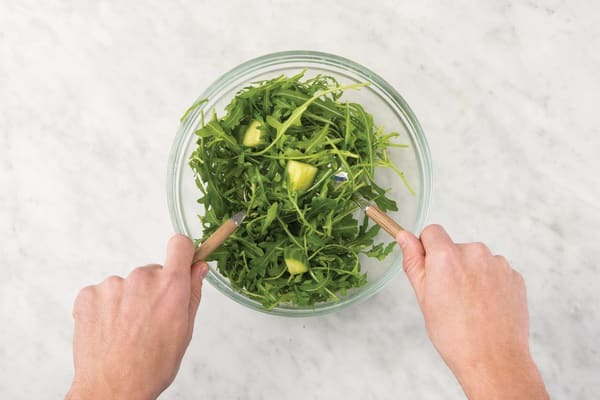 Add the rocket, cucumber and the greens of the spring onion to the bowl with the dressing and toss to coat. DTIP: Do this just before serving to avoid soggy leaves.